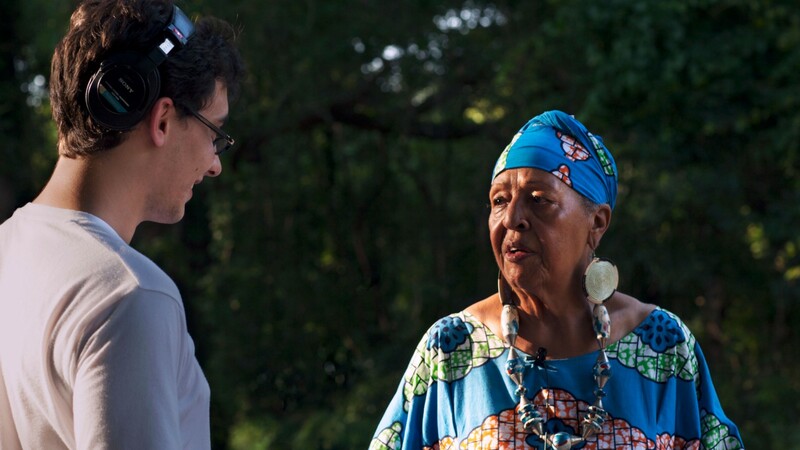 Freddie Andrade works with Gullah language activist Caroline Jabulile White in Charleston, South Carolina. On first glance we might assume it’s some dialect of English. There are some instantly recognisable words, as well as some other familiar words in a non-standard spelling. But could you say exactly what this sentence means? If we translate each individual word, might it become clearer? Haven’t I told you already that I’m not going to do anything further? She waan mi fi come back cause a she one deh-deh and she fraid. She wanted me to return for she alone was there and she was afraid. Nabadii na a kom ina mai aus. Nobody is going to come into my house. Dem miit op dem wan aneda pan di ruod. They met each other on the road. Notice some more details about the differences between the Patois sentences and their English translations. Again, we see that one language’s subject pronouns are used for the other’s object pronouns, and Patois seems to allow double negatives where English does not. We also see little words used alongside verbs, most likely as grammatical particles influencing the tense of the verb. The fi in fi come could be seen as indicating a subjunctive meaning (She wanted for me to come back. ), and the a come seems to indicate future tense (n.b. the discrepancy in spelling of come and kom is due to differing sources and the lack of a standard spelling). Jamaican Patois emerged by the early 18th century as the language of slaves working on sugar plantations on the Caribbean island of Jamaica. It is mainly based off of various 17th and 18th century dialects of English spoken by slaveholders with strong Niger-Congo influences, particularly from the Akan language. Jamaican Patois is indeed a language in its own right. It is what is commonly known as a Creole language, defined as a language that has developed from contact between two unrelated languages, usually passing through a preliminary, less-developed pidgin stage. Over the course of this series, we will examine what this means exactly and dissect the details of just how Creole languages emerge. Further, we will see that Creoles usually share similar socio-linguistic backgrounds and develop out of similar historical contexts, i.e. cross cultural contact resulting from colonization, slavery, and trade. Venecia speaking both English and Jamaican Patois. For Patois, skip to 00:05:15. We will observe how Creoles have also been lumped together in a kind of loosely defined language family based on perceived linguistic similarities. This has had a huge effect on how language development and change has been understood — or misunderstood. Finally, we’ll address how Creoles fit into grand scheme of world languages and how one might go about categorizing them. For now, though, let’s take a look at the variety of Creole languages worldwide and get an initial feeling for how Creoles might relate to their parent languages and to each other. Mi wok long ofis bilong haus sik. I work in the office of the hospital. Again, we see a sentence of exclusively English-origin words (despite non-traditional spelling) used in non-English ways. Mi is used for “I”, as in Patois, and the prepositions long (“in”, cf. along) and bilong (“of”, cf. belonging to) differ from English, though the meaning is clear. Haus sik is an innovative compound word for hospital. Long moningtaim bai mi kam long yu. During the morning, I will come to you. In this sentence we see long again as a preposition with a broader range of meaning than its parent “along”. Bai here is short for baimbai and is the future tense marker, coming from the English “by and by”. The usage of tense-marking words before verb roots is a common characteristic of many Creoles (see the use of done and a in Jamaican Patois above). The following sentence introduces a grammatical concept that may be a bit harder to grasp. Long wanpela de wanpela pik i bagarapim tenpela gaden. In one day one pig destroyed ten gardens. Tok Pisin employs the suffix -pela after adjectives and numbers, often serving as a kind of measure word for counting objects, as in Chinese. That is to say, -pela, derived from “fella”/”fellow” is a unit of any given object being counted. In the example we see wanpela de (*one fella day), wanpela pik (*one fella pig), and tenpela gaden (*ten fella garden), meaning “one day”, “one pig”, and “ten gardens”, respectively. Bagarap means “to destroy” and comes from the English “bugger up”, while the -im suffix, from “him”, indicates transitivity of the verb, i.e. that the verb takes a direct object. Thus we can understand the sentence as, “In one day one pig destroyed ten gardens”. Tok Pisin and Jamaican Patois are only two examples of a long list of English-based Creoles. There are many such languages spoken around the Caribbean: Belize Kriol, Bahamian Creole, Samaná English in the Dominican Republic, Sranan Tongo in Suriname, Guyanese Creole, and Trinidadian Creole, to name just a few. Even as far north as South Carolina, the Gullah language can be found. The west coast of Africa features many English-based Creoles, including Nigerian Pidgin, Cameroonian Pidgin English, and in Sierra Leone, Krio. Finally, the South Pacific, Australia, and East Asia have many of their own English-based Creoles: Singlish in Singapore, Australian Kriol, and Hawaiian Pidgin. English, however, was far from the only language that spawned Creole languages. Almost any language that was brought into a new area by traders or colonizers led to the development of Creole languages. Portuguese was one of the languages that contributed to the most Creoles, due to the expansiveness of the Portuguese trade empire and their instrumental role in the Atlantic slave trade. The more well known Portuguese-based Creoles include Cape Verdean Creole, Macanese Patois from Macau, and Papiamentu. Papiamentu, spoken on the ABC Islands of Aruba, Bonaire, and Curaçao, is particularly interesting, given the diversity of its origins. These islands have been home to many different peoples, each having left their mark on the language. E a bini bèk di e kunuku pa kumpra bukinan den e pakus. He came back from the countryside to buy books in the store. This sentence might not be very transparent at first, and rightly so; it contains elements of Portuguese, Spanish, English, Arawak, Dutch, and West African languages. Bini is from the Portuguese vir and/or the Spanish venir (to come), as is kumpra from comprar in either language, though it shows a more Portuguese pronunciation here. Bèk is from English, bini bèk meaning “come back”. Kunuku is an Arawak term from the original inhabitants of Curaçao. Buki is from the Dutch boek, while the plural suffix -nan is thought to come from any number of West African languages, probably of the Kwa group. Pakus (store) is also from Dutch and means “store”. The original word pakhuis meant “warehouse”. Few other Creoles manage to so seamlessly incorporate such a vast variety of elements into one language, and this is the very special nature of Papiamentu. We will revisit this language later in the series and delve into just how all of these different languages combined to create such a beautiful Creole. French, German, and Spanish also influenced many Creole languages around the world (Haitian Creole, Unserdeutsch, Chavacano, et al. ), but it is important to remember that speakers of non-European languages also colonized and traded, resulting in some of the lesser known Creole languages. Languages such as Uyghur, Assamese, Chinook, and Arabic all gave way to Creoles, making the Creole category an exceptionally diverse and unique grouping of languages. ‘Ana gi-’fi fi ‘kátíbu ‘buku. I am (habitually) writing a book. Here ‘ana, the first person singular pronoun, is directly from the Arabic أنا, and ‘kátíbu is taken from the Arabic verb كتب, “to write”. Gi- is a progressive tense marker, and the first ‘fi is an existential verb while the second fi means “in”, both deriving from the Arabic في. ‘Buku is a clear loanword. Thus we have a kind of restructured Arabic, a language made mostly of Arabic words but organized in a way that reflects more diverse origins. In the coming installments, we’ll continue to look at Creoles more closely. We’ll look at some of the challenges that Creoles and Creole speakers have faced due to the socio-historical contexts that led to the formation of these languages and their cultures. We’ll examine how history has shaped the study of Creoles and what biases and misunderstandings have survived in the study of Creoles to this day. Finally, we will try to understand how different phenomena of language change shaped Creoles and what this tells us about the relationship between Creoles and the rest of the world’s languages. In the next installment, we take a closer look at the prevalence of racialized paradigms in Creole linguistics.